We would like to engage in a bit of enlightenment. Advocating an uncomplicated user experience, we keep GroopDoo very easy for our users, adhering faithfully to the keep it simple principle. Of course, we must master many legal, technical and economic challenges. Here, we explain some of the prerequisites for positioning the platform. To develop the concept, we first had to create a mechanism providing super simple organization and payment transactions for group activities. Since the German financial sector is much more strictly governed, in contrast to other EU countries, we had to discover how to install a payment system complying with both ZAG (Zahlungsdiensteaufsichtsgesetz - payment service control law) guidelines and the BaFin (Bundesanstalt für Finanzdienstleistungsaufsicht - Federal Institute for Financial Services Surveillance) regulations. It's not for nothing that our competitor Tilt is not represented in Germany, but works out of the UK. Research into the pertinent lawbooks showed that crowdfunding for events in Germany is certainly possible without requiring a bank license or trust fund account. However, the strict BaFin surveillance renders this difficult, to put it mildly, and diverse snares had to be untangled since our business model is directly related to financial transactions. Every internet platform saving data and involving financial transactions must have very trustworthy security. We apply coded data channels and security certificates for the platform's data exchange. Furthermore, our server architecture and administrative data processes are protected from external access over numerous systems. We bank on PayPal for our transactions, having won their partnership through a release process involving several steps, including the examination and certification of our code and access by PayPal experts. We are also obligated to prevent financial abuse, guaranteeing cashflow security. As our business angel's enterprise is a national expert on coding and secure storage of digital information, we have received excellent advice and could powerfully profit from the experience of active market developers. Catering to our users' comfort, it was important to make the platform and visual impression modern, as well as ensuring use is as easy as possible to use intuitively. To this end, we carried out many user tests and applied their feedback to the result. We believe we offer a platform focusing on the essentials. On the other hand, and that was the tricky part, we had to incorporate legally binding aspects without detracting from platform intuition and simplicity and without irritating the user. We want to continue to improve, and look forward to your feedback and criticism at feedback@groopdoo.com. From an IT perspective, the platform's scalability is designed to be independent of the number of simultaneous users. The platform's current maximum load lies in the mid-ten thousand clicks per second. The platform is already prepared to dynamically react to growing demands by activating additional resources and virtual servers when visited by a high number of users. The scalability is efficiently ensured with a dynamic server architect. Thus, we can work cost-efficiently with a growing number of users, as the server resources increase only minimally with a higher load. To keep the site up to date, to expand functions and to efficiently alter parts of functions, we rely on the most modern of development paradigms gleaned from years of empirical values. The platform is modularly designed and can be easily expanded to encompass additional frameworks or APIs. This makes it possible to involve additional personnel quickly, foregoing elaborate onboarding development processes. The code structure enables reuse of many parts for future expansion, such as a native app. Naturally, we don't want to keep you in the dark about our new developments. 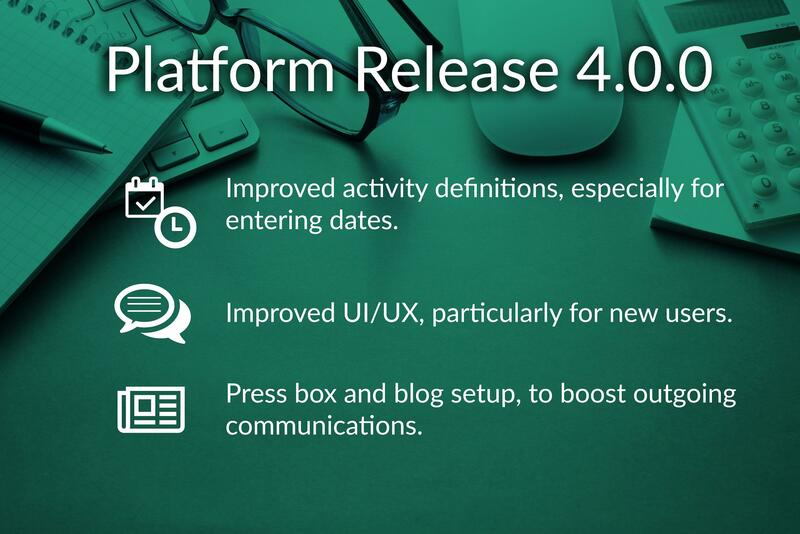 Last Thursday, the Release 4.0.0 went online. Furthermore, we have accelerated and increased the efficiency of our cooperation with PayPal (Instant Payment Notification API). To offer our users more transaction options, we have spoken to numerous payment providers and hope to soon supply even easier and more comprehensive payment components on the platform. We'll keep you informed. You have probably already noticed some changes. Entering activities is even easier and more detailed now, allowing for a precise time when choosing a date, instead of simply entering the activity description. To facilitate new users’ platform use, we have integrated explanatory dialogues for the interaction with our platform. Due to the increasing number of inquiries for press information, we have installed a press box (groopdoo.com/pressebox) where all necessary information regarding press inquiries has been compiled. In addition, the UI has been improved thanks to suggestions and criticism regarding user flow. Naturally, we are open to your suggestions and pointers. Simply send us an email at: investor-relations@groopdoo.com or write a comment on this update.